Nano-impact testing was originally designed to assess the toughness and fatigue fracture resistance of thin films and coatings. Nano-impact testing is also able to mimic highly loaded repetitive contact situations. This includes assessing the durability of high speed machining tools for hard to cut aerospace materials and the erosive wear of aerospace engines in normal working environments. Repetitive contacts are true impact events. The probe repeatedly leaves the surface of the sample and impacts at the same location every time. Nano-impact testing on the NanoTest Vantage is simple, rapid and flexible. The instrument can be bought with Nano-impact capabilities or an Impact module is available for an existing instrument. The progression of damage is monitored by recording the position of the impacting diamond probe throughout the test. A cube corner diamond indenter is often used as its geometry induces high contact strain. This high strain is useful for inducing fracture within a short test run. Periodic electromagnetic actuation moves the probe, repetitively, to about 10-15 microns before accelerating and impacting upon the surface of the test material. In a recently published paper, Bouzakis compared the performance of multilayered PVD TiAlN coated systems. Such systems are an effective method of prolonging coated tool life. Nano-impact testing proved to be a powerful aid in optimising layered systems. Tool life for milling hardened steel (number of cuts) was compared to the max. impact depth . 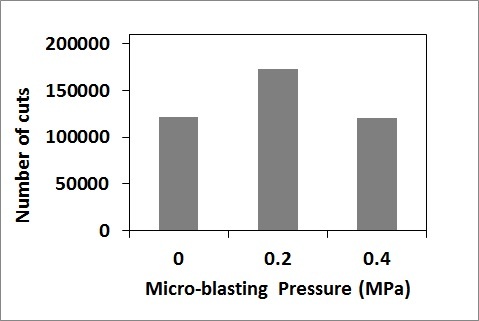 Figure 2 shows the excellent correlation between cutting performance and impact resistance for various systems. 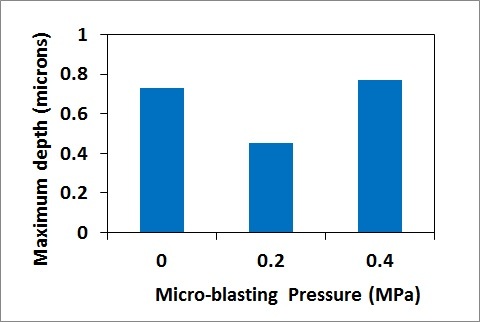 In an earlier paper, nano-impact testing was used by Bouzakis to investigate the effect of pressure variation during the micro-blasting of coated cemented carbide inserts with ZrO2. Brittleness and fatigue effect of mono- and multilayer PVD films on the cutting performance of coated cemented carbide inserts. G.Skordaris, K.-D. Bouzakis et al. CIRP Annals – Manufacturing Technology 63 (2014) 93-96. 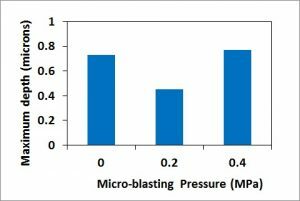 The dry micro-blasting of coated cutting tools may potentially improve performance. The induced compressive stresses in the film structure increase the hardness of the coating. However the brittleness of the coating is also increased. Data from their study (Figures 4 and 5) again shows a direct inverse correlation between tool life (the number of cuts) when milling hardened steel and the max. 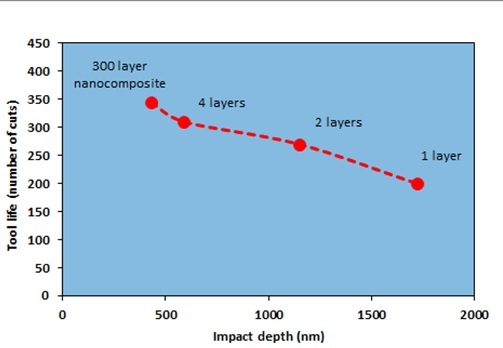 impact depth of the PVD coated films. Pressure was identified as a critical variable. The switch in wear resistance and impact resistance from 0.2 to 0.4 MPa is clearly demonstrated. 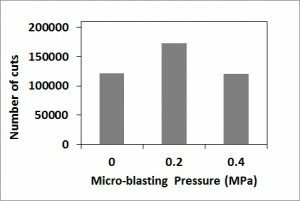 Influence of dry micro-blasting grain quality on wear behaviour of TiAlN coated tools K.-D. Bouzakis, F.Flocke et al. Wear 271 (2011) 783-791. Nano-impact is not restricted to repetitive testing. A single impact nano-impact testing is essentially a high strain rate indentation test. Analysis of the impact-time data can determine the “dynamic hardness” of material, i.e. its effective hardness at a given strain rate.